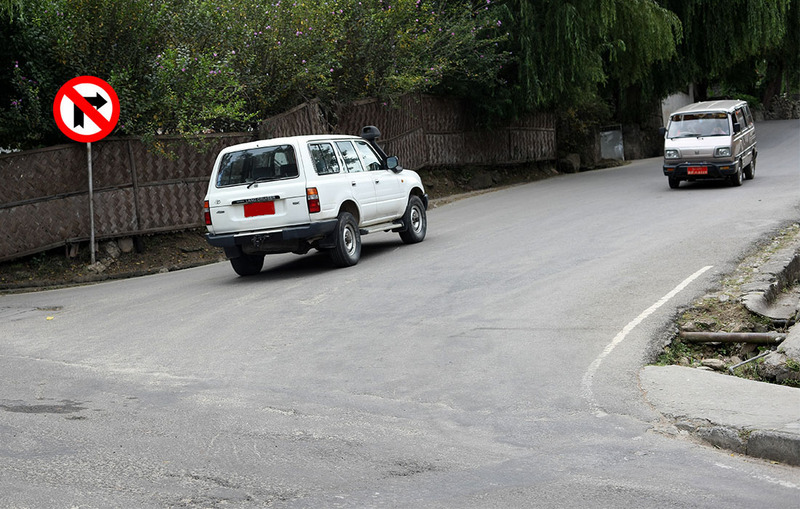 The talk that is now doing the rounds in Thimphu is that the government is likely to change the Pedestrian Day from Tuesday to Sunday. Supposedly, the government is yielding to the popular sentiments of the people. But how can that be true when the reality is that the combined workforce of the private and corporate sectors far out number the civil service? In my view it is a myth that Sunday is a less cumbersome day to impose a ban on vehicular movement. The reason is simple: unlike the civil service who have two full workless days, the employees in the private and corporate sector have only one (Sunday) full day to devote their time to do personal work. Therefore, it would be unfair to inconvenience them by imposing a Pedestrian Day on a Sunday. Strangely, a large number of people see the Pedestrian Day as an inconvenience and an undemocratic imposition on the will of the people, rather than an attempt to improve our current economic woes. Typically, the Bhutanese people believe that it is entirely the responsibility of the government to solve all their problems while they remain unmindful of the part they must play. With such a mentality, is it likely that the people will stop complaining even if the Pedestrian Day were to be shifted to Sunday? I doubt it. The Bhutanese people are a happy lot as long as the government and the King doles out kidu; ask them to work for their keep and they are an estranged lot. I am told that the so called “business leaders” have threatened to go on a silent protest if the government did not do something about the Pedestrian Day. They have the gumption to call themselves “business leaders” and yet, pathetically, they do not have the inventiveness and ingenuity and the cunning to rework their work schedule to suit the Pedestrian Day timing. They are petrified about some marginal profit loss arising out of one day of closure in a week, rather than fear the possibility that if they do not buck up and take heed, they may stand to lose their entire businesses. I am convinced that the Bhutanese people suffer from some acute pathological problem of lawlessness. Look at the following two photos. There is a huge signboard that says NO RIGHT TURN and yet, the driver of the Toyota Landcruiser completely ignores the warning and blatantly enters the NO ENTRY zone. Those of you who live and drive in Thimphu would recognize the diversion point as the one right below the office of the Ministry of Labour & Human Resources in lower Motithang. Tell me, truthfully, how many of you have been blind to the signboard and made a right turn where that sign is posted? I guess quite of few of you. 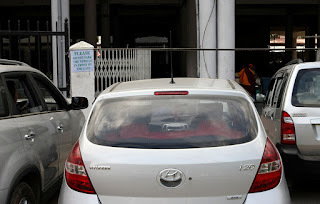 There is a notice posted on the gate of the Centenary Farmers' Market that cautions people against parking in front of the gate and yet, cars throng the point of entry - to such an extent that the gateway is completely sealed off thereby hindering access to shoppers wishing to enter the market inside. This article is posted on a Pedestrian Day. (PS: I intentionally obliterated the Toyota Landcruiser's registration number plate since I believe that it is not fair to single out the owner when every one else does it. Same thing with the cars parked in front of the Centenary Farmers' Market gate. I cropped off the number plates because they are not the only ones who do it). Time has come now to give way to ego and be reasonable and put on shoes of those who suffer for their sustenance and livelihood. Let's have pedestrian day ONCE A YEAR IN A GRAND STYLE. What is your opinion/views? Won't it be GREAT? I think you are lot more smarter and intelligent than to believe that the Pedestrian Day is an ego trip. But if you do believe it to be so, then I fully understand your confusion. As to the question of one Pedestrian Day a year, I do not believe that it would yield the results that we are aiming at. Unfortunately, I suspect that even with one day a week, the PD is unlikely to yield any substantive results. The reason is simple - take a drive along the Ring Road on a Tuesday and see for yourself why the PD is unlikely to make much of a difference. I believe that disaster is eminent and yet, as strange as it may sound, that may be the only way to teach the Bhutanese the value of ownership and responsibility and discipline. Pedestrian Day is merely symptomatic of the tendency of valuing form over substance. Like the ban on plastic bags, public smoking (before the tobacco sale ban) and meatless months. They make great marketing copies outside of the country, but achieve very little else. Bhutanese are no more or less pathologically lawless than anyone else. It's the lack of incentive to stay within the line, or perhaps more accurately, the lack of disincentives to breaking the rules. So what if you make an illegal turn or park haphazardly. Practically nothing. Everyone else does it. I would be stupid not to. I am not Bhutanese, but when in Rome do as the Romans. There is a rule requiring foreigners to get route permits for travel outside of Thimphu and Paro. I stopped getting those after my first month. I remember feeling a pinch of guilt the first time I went pass the Hontsho checkpoint without stopping even though I had my permit. But that quickly faded when I realised nobody cared. The checkpoint required me to voluntarily stop the vehicle, get out and present my papers. Not once was the vehicle stopped in all the times I had gone by. I never got another permit subsequently for personal travel, especially when everyone I asked couldn't give me a convincing reason for requiring route permits in the first place. Perhaps you or your readers can shed light on that. You may say I was exceptionally lucky in not being caught, but it's easier to believe that nobody cared about really enforcing that rule. It is simply one of those rules, not unlike many others in the country. Unenforced, toothless and really just for show. Totally agree with you. But I disagree that you were lucky. If anything, our Immigration Officer at the Hongtsu Check Gate was provably sleeping on his chair or else where ... and not doing his job. Our people don't do what they are supposed to do and in the process, they allow law breaking foreigners like you to get away disregarding the law. But as you say, a large number of people have now become accustomed to thinking, like you do: "why should I stay within the law when every one else is outside of it?" But surely you know that that kind of thinking is like that of one of our MP's who said on national TV: "How can a small country like Bhutan make a difference when the largest polluters like China and India don't care and do their part?". That is a dangerous way of thinking. I don't understand this big protest on Pedestrian Day. I think it's great. Don't worry; even if the Pedestrian Day is changed to any other day from Tuesday, there will be complaints from another quarter. The government cannot satisfy all sections of the public. The section that can afford the loudest (read influential) voices, would naturally be heard most. I think the government should stick to their decision. Silent Protest by Business Leaders? OMG, that would be great! I mean just imagine we will get to see who the Selfish Big Idiots are. Far be it for me to contest whether it is dangerous thinking, but suffice to say that this thinking is not uncommon, and perhaps, human nature. I do not see the problem as lawlessness in the people, but of ineffectual legislation and the lack of political will. Until laws are applied and justice is seen to be done at the highest levels, the common masses will continue to ignore these everyday rules. For realistic and pragmatic purposes, that MP is not incorrect. The Chinese and Indian leadership are not unintelligent buffoons. They have weighed the costs of environmental protection against the aspirations of their populations to rise above abject poverty. I know this opinion is controversial, but moral superiority is an extravagance when large portions of your populations struggle for their daily sustenance. The situation is improving, and it will not be long for the day when China and India can be justifiably rapped on their knuckles for not investing in more sustainable development and reform.